SAN FRANCISCO — (BUSINESS WIRE) — August 2, 2016 — Intel SoC FPGA Developer Forum, August 18, 2016 - ReFLEX CES, a leading provider of custom embedded and complex systems, will showcase its expertise in the design and manufacture of complex SoC FPGA cards at the Intel SoC FPGA Developer Forum 2016. Highlights of the stand include Arria10 SoC Instant DevKit & OpenCL demos and the new Arria10 Low Profile FPGA PCIe cards and modules. Intel SoC FPGA Developer Forum (ISDF16) provides the perfect platform for ReFLEX CES to reveal how it is further extending its proven position as a key provide of SoC FPGA-based solutions. ReFLEX CES is taking advantage of this exhibition to announce its new Arria 10 SoC FPGA System-On-Module targeting a wide range of markets including Automotive, Video Broadcast, Machine Vision, Industrial, Military, Test & Measurement and Medical. ReFLEX CES is also highlighting at this exhibition its new Low Profile Arria10 GX FPGA cards which complements the existing High-Performance Computing and Finance solutions. See also the ATTILA (Arria10 GX) and ALARIC (Arria10 SoC) Instant-DevKits offering developers an out-of-the box design solution that combines a compact hardware platform with an efficient, intuitive software environment. The DevKit’s unique install and graphical user interface enable an immediate start, and its reference designs enable fast turn-around for short, secure developments. Both options are now available with production FPGA devices. REFLEX CES will also demonstrate HPC (High Performance Computing) OpenCL BSP (Board Support Package) working on its ALARIC (Arria 10 SoC) and ATTILA (Arria 10 GX) Instant-DevKits. 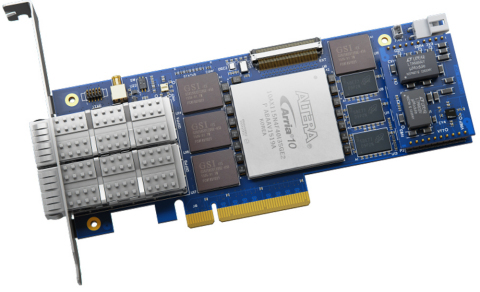 These solutions are a ready to use PCIe Arria 10 GX/SoC FPGA-based hardware accelerator and offers users, a quick way of implementing complex parallel algorithms in FPGAs. The ReFLEX CES portable Evaluation Station provides everything users need to immediately start OpenCL designs and will be showcased at the ISDF16 show. To schedule a meeting with ReFLEX CES, please email epenain@reflexces.com. From specification to contract manufacturing, ReFLEX CES’ expertise lies in designing complex electronic high-density FPGA-based boards, rugged systems and fully customized turnkey embedded solutions. Recognized for its expertise in high-speed applications, analog and hardened systems, ReFLEX CES has become a leading partner with major industrial companies. Its solutions range from a catalog of FPGA-based acquisition and processing boards to customized designs and manufacturing services in small and medium series. They address a wide range of applications in the fields of defense, aerospace, telecommunications, Big Data, finance, vision, medical and industry.